A lot of people have been asking me for my Snickerdoodle recipe, since I posted my new Salted Caramel Snickerdoodle Hot Chocolate recipe! 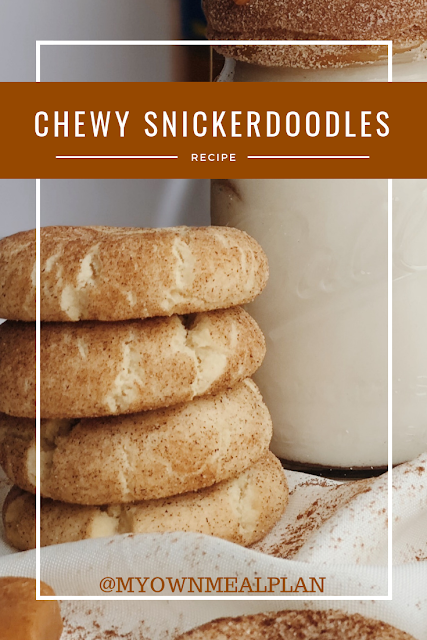 This is my go-to classic snickerdoodle recipe! They are soft, chewy, and delicious! You have the option of stuffing them with salted caramel, or just cooking them up the traditional way! Make it with me! Two of my favorite fall flavors are salted caramel and snickerdoodles! YOU GUYS! This recipe is part of the Torani #PumpkinSoBasic challenge and I am competing in it! The contest runs from September 5th - September 14th and I NEED YOUR VOTES!! Please, Please, Please, click this link http://wshe.es/KBewsXn4 and vote for my recipe as your favorite new fall flavor!! If you vote for me, on 17th of September, I have a coupon code I am going to be sharing with you! Help a sista out! Thanks so much everyone!! Pumpkin Spice Latte (PSL) was so 5 years ago. Don't be Basic! Start your own Fall trend with one of Torani's 100+ flavor options! It's time for a fresh new flavor combination to be born! I have created an all new hot chocolate flavor! Drum roll please..... Salted Caramel Snickerdoodle Hot Chocolate! It's sugary, simple, and easy to make! Try this new awesome flavor combination this fall! Make it with me! This post is sponsored by Torani, but the opinions expressed are my own. In a stand mixer cream butter and sugar together. Next, add the dry ingredients; flour, baking soda, baking powder, cream of tartar, and salt. Mix on low until dough forms. In a small bowl, combine granulated sugar and cinnamon for topping. Scoop dough into 2 inch balls. Roll balls around in sugar mix until coated. Bake for 10-12 minutes or until cookies are golden. **Optional- if you want to make these snickerdoodles salted caramel stuffed, simply add a small cube of caramel to the center of each dough ball before rolling in cinnamon sugar! It's delicious! Print this Snickerdoodle recipe here!